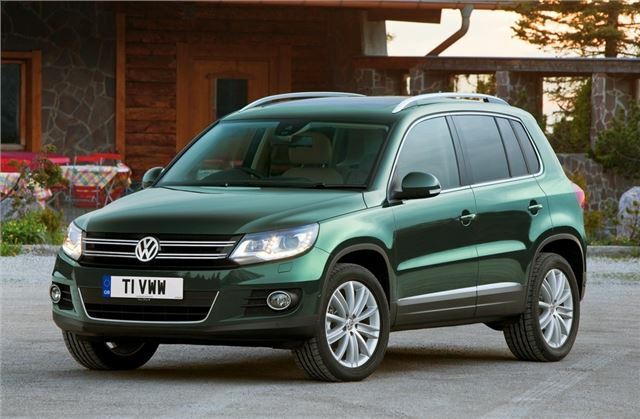 The facelifted Volkswagen Tiguan is now on sale with a fresh look on the outside, a range of new engines and an optional electronic differential to improve handling in corners. Prices start at £21,085 rising to £28,020 and the first deliveries will begin in September. The new look is most noticeable at the front where the Tiguan gets the now familiar 'new' Volkswagen family face, giving it a more similar look to its larger counterpart, the Touareg. At the back there are new two-part light clusters which from an 'L' shape. As with the pre-facelifted model, the new Tigaun comes with two or four-wheel drive and there's also an option of two different front ends. The standard one is designed for on-road driving while the 'Escape' model has a 28 degree approch angle (rather than the standard 18 degree) plus extra off-road assistance systems. There are six engines in the Tiguan range - three petrol and three diesel. Four of these are new to the Tiguan, including a twin-charged 1.4-litre TSI with 160PS (up from 150PS in previous generation), a 2.0-litre TSI with 180PS and a 2.0-litre TSI with 210PS (previously 200PS). Despite the increase in power CO2 emissions have remained as before or improved. A 2.0-litre TDI with 110PS is available in two-wheel drive with emissions of 139 g/km. The other two diesels are carried over from the previous generation (the 2.0-litre common rail TDI with 140PS and 170PS). All have improved CO2 emissions with the 170PS engine now emitting 158g/km rather than 165g/km, while the 140PS sees CO2 reduced from 164g/km to 150g/km with the manual gearbox and 169g/km to 158g/km for the seven-speed DSG. Both the 2.0-litre TDI 110PS and 140PS models, as well as the 1.4-litre TSI 160PS with two-wheel drive are designated BlueMotion Technology models and come with Stop/Start and battery regeneration systems to improve fuel economy and reduce emissions. There are four trim levels - S, SE, Sport and Escape. All models get 16-inch alloy wheels, climatic air conditioning, a DAB radio plus an alarm. SE models add 17-inch alloys, 2Zone electronic air conditioning, Park Assist, iPod and Bluetooth preparation plus a new Fatigue Detection system (as fitted to the new Passat). Sport versions gain a multi-function steering wheel, Bluetooth, chrome plated roof rails, heat insulated and tinted glass from the B-pillar back, sport seats, front fog lights and sports suspension. The Escape model now has Bluetooth and a multi-function steering wheel which were not previously available. A number of options are available for the first time on the latest Tiguan, including Kessy (Keyless Entry and Start System), the RNS 315 satellite navigation system, Lane Assist (which helps prevent accidents caused by the driver drifting out of the lane) and Light Assist which switches between dipped and main beam depending on oncoming traffic. Also available as an optional extra is the XDS electronic differential lock – as fitted to the Golf GTI. An extension of the electronic locks already integrated via ESP, XDS improves handling when driving quickly through bends.